The NHL isn’t full of Christians. It may be surprising, then, to hear me say that my years in pro hockey have been the most influential in my relationship with the Lord. I’ve met some incredible teammates and NHL staff who have encouraged and strengthened me in a proverbial “iron sharpens iron” kind of way. 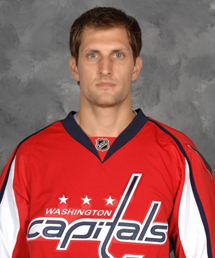 • Has played for the Atlanta Thrashers, Ottawa Senators and Washington Capitals during his career. • In 2009, he returned to the lineup for the Caps’ playoff run after suffering a concussion early in the regular season. My story starts in New Bedford, Mass. Like so many others, I was raised in the church but never really had a personal connection with Christ. I could do the routine very well, but I didn’t really understand it. But, deep down, I desired a connection to God and wanted so much more spiritually. I was a 15-year-old high school sophomore when a friend invited me to a Bible study through his church. It was on that first night that I really met God. I started to understand what the preacher was talking about, and it became so interesting. I was hooked. After I initially gave my life to Christ, I didn’t have many people pouring into me, and I felt like I was on an island. For the first five or six years and throughout college I had good pastors and people speaking into me, but it wasn’t until my first year in the pros that I really connected with godly men who helped me go to the next level. At my first NHL training camp in 2000 I met Adam Burt. I’d read about him in a Christian magazine, so I introduced myself. He was my defense partner during camp, so he and I connected right away, and he spoke powerful truth into my life. Adam also introduced me to John Blue, a former goalie for the Bruins and Sabres, who is now pastoring a church in California. Over the years, John has become a really important part of my life as well. Living out my faith is a challenge every day. As Christians, whether we work regular 9-to-5 jobs or are professional athletes, we all come into contact with different things that mold and shape us. For me, the challenges that shape me most are the times when I’m not playing well or am in a rough point in a relationship with a coach or teammate. In order to handle these situations in a way that honors the Lord, I have to stay grounded and remain centered in God. The older I get, the more I feel like I have an influence on the younger players. I think they respect the way I live my life and the choices I make. That being said, I’m with these guys almost 24 hours a day, so I can’t just get on my soapbox and start preaching. If I don’t have grace with God’s truth, it just becomes a matter of time before they tune me out. It’s important to learn the art of having tact and grace when standing for something and to not judge or be critical of those who don’t believe what I do. Every time I interact with others, I want to glorify God. I want to make sure people know I care about them and respect them, and I want to make sure I do what I can to glorify God in that moment. Every day on the ice, I want to be excellent and lean on Him to give me strength and confidence. Off the ice, my faith is everything when it comes to being a father and a husband. I have “Ephesians 5:25” engraved on my wedding ring. That verse says, “Husbands, love your wives, just as Christ loved the church and gave Himself for her…”(NIV). I try to love my wife as Christ loved the church. I try to look out for her and love, respect and appreciate her. We are a united front, and I want to grow with her. And, as a dad, I want my children to grow up loving God and sharing Him with others. One verse that has been on my heart most recently has been Matthew 6:33: “But seek first the kingdom of God and His righteousness, and all these things will be provided for you.” Sometimes life gets so hectic and crazy with so many demands and people pulling at us. If we don’t give God His due and give Him that time daily, we are really missing the whole point of living for Him. Every minute of every day, we need to put Him first. When we do that, He will always take care of the rest.